*Data taken from official Alpha Psi Omega honor cord provider website on 3/12/2013. Alpha Psi Omega Graduation Cords compare best to our double tied honor cord that come in the colors light blue and antique gold. Both of these colors (sometimes moonlight blue is referred to as sky blue) translate nicely into the colors light blue and antique gold from Honors Graduation. Another term used to describe Antique gold is old gold. However, our cords are anything but old. Graduation Honor Cords from Honors Graduation are of the highest quality and standard length. Light Blue and Amber Cords are no exception and we are sure that you will be pleased with your purchase here. Be sure not to confuse cords from Honors Graduation with cords from any official Alpha Psi Omega honor cord supplier. We are not an official supplier of honor cords for Alpha Psi Omega. Honors Graduation has no minimum graduation cord order, and we have an affordable and fast flat rate shipping option. Most honor cord orders are shipped the same day they are purchased, if the $4 flat rate shipping option is selected they will arrive in 4-6 days, sometimes sooner. We also have options for faster shipping if you need your Honor Cords in a hurry! 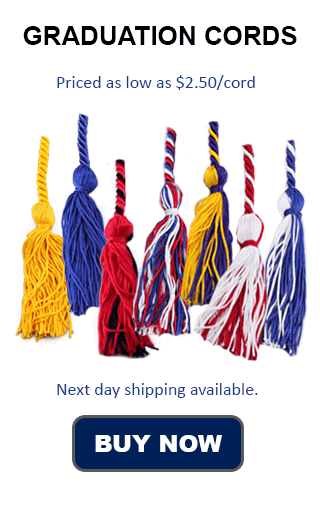 We also offer 3 day shipping, 2 day shipping, and next day air (overnight express) shipping on our graduation honor cords of all colors. If you need light blue and old gold graduation cords shipped to you in Canada or anywhere else outside the United States we also have affordable international shipping available. National theater honor societies recognize students in Theater at the University and College level. There are many active chapters for theater students across the nation, and membership is based on a merit or experience point system. Different chapters have different induction standards, but theater experience is the uniting factor.